Little baby steps after long bleary hours of Internet searching. As per my last post, my Fraser goal was to return to the preliminary writing I'd done, revising and plugging holes as I go. But quite out of chronological order, I wanted to pursue a long delayed hunch. Plunging right into frenzied database searching brought some promising but fragile results. Results … not for my missing-in-action John Fraser the blacksmith of St Andrews East, but maybe for two of his other kids. Per the Presbyterian church register (which gives dates of birth) John had two daughters, my great-grandmother Catherine (1833-1914) and Eliza (4 Feb 1839), two sons John (25 Jan 1835) and Duncan (10 Nov 1837). Those last three kids have also been missing in action. Quebec censuses and the Drouin Collection have not yielded anything hopeful. The hunch was—of course—that they left la belle province. Why not start with Ontario? Their sister Catherine went to Renfrew in the late 1850s. First up was Ontario marriages on Ancestry.ca. The name Duncan is way easier to search for than Eliza/Elizabeth/Elisabeth/etc but nothing rang any bells there. One, only ONE, marriage presented itself for an Elizabeth Fraser whose parents were John and Ann. While her mother was commonly known as Nancy, it's a nickname for Ann, her baptismal name. Parents' names and the location look promising although Elizabeth's age was close, but not exact, for an 1839 year of birth. The Ancestry entry is a transcription only, not a digital image, so the original (microfilmed) register must be consulted—more details like place of marriage and religious affiliation may be forthcoming. Elizabeth Fraser of Renfrew, born “in Canada,” age 19, daughter of John & Ann, married Alexander Gordon of Pakenham, born in Canada, age 25, son of George Gordon & Isabella Murray, on 30 October 1860 in Renfrew County;“Ontario, Canada Marriages, 1801-1928,” database, Ancestry.ca (www.ancestry.ca : accessed 17 September 2011), Gordon-Fraser marriage (1860); citing Archives of Ontario microfilm MS 248 reel 14. Meanwhile, it was time to scour census returns. In 1861 and 1871 the Gordons lived in Pakenham, Lanark County, which is on the southern border of Renfrew County. Alexander was a merchant. From 1881 to 1901 they were in the town of Pembroke, Renfrew County; Alexander was a lumber merchant. In that period, Elizabeth's place of birth was thrice given as Quebec, once as Ontario. IF she is “mine,” she was consistently knocking two years off her age. The couple more or less seemed to follow Highland naming tradition: their first daughter was Isabella, the second Ann; the first son was George. The name John (for Elizabeth's father) does not crop up until the fourth son. Elizabeth Gordon, wife of Alexr Gordon, died in the town of Pembroke on 1 October 1891: age 49+ 8/12; born in Quebec, Presyterian; cause of death pulmonary consumption during two years, Dr. W.W. Dickson; “Ontario, Canada Deaths 1869-1938,” digital image, Ancestry.ca (www.ancestry.ca : accessed 17 September 2011), Elizabeth Gordon, no. 014427 (1891); Archives of Ontario, MS 935. Next, the Ontario Cemeteries Finding Aid and the exceptional Canadian Gravemarker Gallery. The latter with its on-site photographs is a wonderful and probably under-used resource. Yes; in Calvin United Church and First Presbyterian Church Cemetery in Pembroke, Elizabeth is buried along with her husband and three children. The gravestone does not add to her information, but thank you Murray Pletsch and all your amazing volunteers! 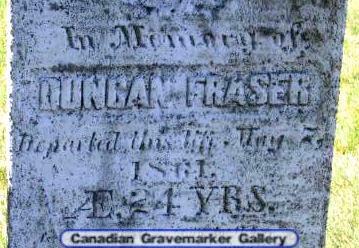 "In Memory of DUNCAN FRASER Departed this life May [7?] 18[6? ]1 AE. 24 YRS." The stone is in St Fillan's Cemetery, Beckwith Township, Lanark County. The location is not far south of Pakenham. If the year is 1861 (what do you think?? ), his age is spot on with my Duncan. The 1861 census shows him as a farmer with a wife Ann, no children, in a household headed by an elderly McGinnis couple. I will have to look on the microfilm for a following page (not all have survived) that would clarify the household composition. Duncan is also shown as born in Scotland (ditto marks from lines above) so I can't get too hopeful. Newspapers of nearby Carleton Place or perhaps Arnprior or Renfrew might be available for potential reference to a young man's premature death. So where is his darn marriage?! Elizabeth Fraser Gordon's alleged age at the time of her death leads appropriately to a February birth, but still a couple of years (1842) off. Pembroke newspapers are calling me for that one. Call me fanciful, but I like to think Elizabeth Gordon named her fourth daughter Kate after her sister Catherine who was always known as Kate in the family. Baby steps on eggshells. Dare I hope this is progress? Pembroke cousins, where are you? I'm working my way through the gravemarker lists and photos, not optimistically, for their father John who could have died any time from 1838 on. The family histories I have been working on have revealed my own particular bent. Apparently I am more interested in pushing back than plunging forward. Thus, a few of the descending branches from Scotland and Latvia peter out with no further information known. The investigation of those branches is ongoing, despite a lot of negativity from the usual sources, just at a reduced priority level. Not to suggest that I don’t welcome the discovery of new cousins and branch twigs. Please keep the new information and connections coming! For one thing, unlike other lines in my ancestry, the Frasers leave me bereft of family photographs. I’m more obsessed with where they trod—the ancestors who gave me and my siblings and my children some share of their DNA. I love to investigate the locations. For the most part I’ve had success with both North American and overseas origins. But the difficult Frasers continue to bedevil me. It’s a good time to stop the research, temporarily, and buckle down to writing. Putting it in writing is always the best way to find coherence, defining the problem areas. ● children who left St. Andrews East also left no discernible tracks. ● the Killin burial ground (Scotland) is in bad shape, not helping with probable earlier generations. Eons ago I began the Fraser family history in a folksy way, thinking it would be less confusing for uninitiated family members, because of the serial Frasers. Now, I’m revising to treat it in more acceptable genealogical form. As I go, one problem at a time can be addressed. Maybe the above lists will shrink! There’s an incomplete feeling without more locations and dates to hang my hat on, figuratively speaking ... a bit of existential angst in my genetic code. Nevertheless, I am descended from a multitude of Frasers. I am as Fraser as they come. Searching for words to describe unexplained gut responses, inherent empathetic reactions, intrigues me. I've been calling it tribal memory ..racial memory .. subconscious cognition .. etc. Well hogtie me and take me to market; a biologist has a scientific term for this: morphic resonance. That last sentence rings sinister: what are we (inadvertently?) contributing to the universal life force in the family memory pool? Five hundred years from now, will my descendants have an inexplicably irresistible craving for buttered popcorn? Much as I like his terminology, the man seques into telepathic studies explaining why your dog knows you are coming home before you get there. It's hard to say, from a decidedly unscientific stance, if the test of time will prove his theories. Maybe only his/our descendants will know. Thanks to Mark Rabideau for bringing this to our attention. This sort of post more properly belongs on my other blog, away from the immediately pressing world of ancestor research, and will be repeated there. I still maintain that instinctive swooning to the bagpipes is morphic resonance. Cuidich! “Rupert Sheldrake,” Wikipedia (http://en.wikipedia.org/wiki/Rupert_Sheldrake : accessed 20 August 2011). “Morphic Resonance and Morphic Fields,” Rupert Sheldrake, Biologist and Author (http://www.sheldrake.org/Articles&Papers/papers/morphic/morphic_intro.html : accessed 20 August 2011). Mark F. Rabideau, “Morphic Resonance and Genealogy,” APG Members Only List, 28 July 2011. Mark's website is Many Roads, http://many-roads.com. Celebration of an awesome summer. Amethyst is more than a colour.